Ever since UFC 129 ended, the rumors of UFC welterweight champion Georges St-Pierre taking on Strikeforce welterweight champion Nick Diaz have been all the talk. On Wednesday, UFC president Dana White made the fight official, announcing that the pair will square off on Oct. 29 in Las Vegas as the main event for UFC 137. Now that the fight has been announced, the puzzle pieces have been put together to form the full picture of what happened when Nick Diaz and his manager and trainer Cesar Gracie met with White in Las Vegas. As it turns out, taking boxing off the table in favor of facing St-Pierre was the only enticement Diaz needed, and he signed on the dotted line. “Absolutely. We would have not given up boxing if they had not offered GSP. The conversation was give up boxing, we’ll give you GSP,” Gracie revealed when speaking to MMAWeekly.com on Wednesday. Diaz was set to face boxer Jeff Lacy in a match-up this fall, but the Stockton, Calif., native ultimately got the challenge he was looking for to remain an MMA fighter for a little while longer. Gracie says it was always that simple because Diaz just wanted to face the best, and when it comes to the welterweight division in MMA, there’s none better than GSP. “It’s that simple. Nick wants challenges, he wants big fights, he wants to get to the next level, and the only way he was giving up the Lacy fight was if they offered him GSP,” Gracie said. As far as roadblocks that existed, Gracie denies that there were that many problems in getting the fight done in the first place. A few details remain in the shadows, but overall he says the fight was offered and accepted, and now it’s been announced. “That whole thing was complete misinformation. 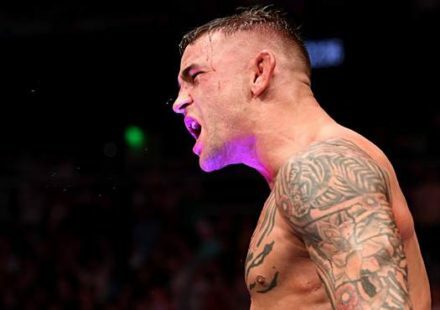 I kind of laughed when I saw that cause I knew the fight was happening,” Gracie revealed when rumors about the fight not happening because of issues raised about a Strikeforce fighter coming to the UFC. St-Pierre last fought Diaz’s teammate and close friend Jake Shields at UFC 129 in Toronto. Following that fight, Shields immediately spoke up for Diaz to get the next crack at GSP. This will be Diaz’s first appearance in the Octagon since UFC 65 in October 2006 when he TKO’d American Top Team fighter Gleison Tibau. When he returns, Diaz plans on leaving the Octagon with gold around his waist. Damon Martin is the lead staff writer and radio host for MMAWeekly.com. Follow @DamonMartin on Twitter or e-mail Damon a question or comment. Follow MMAWeekly.com on Twitter and Facebook.